Widewater has special (SNCI) status as a unique Saline Lagoon. 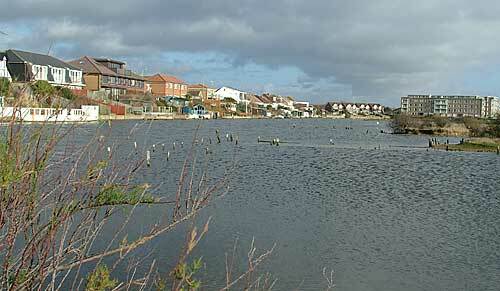 It is one of the areas of Sussex that is the subject of an Action Plan by the Sussex Biodiversity Partnership. The brackish lagoon was formed in about 1840 when an embankment was constructed from ground on the south side the coast road. The shingle bank on the right was formed by longshore drift, it extended across the mouth of the river Adur and formed the present harbour. A breach through the bank is now the harbour entrance. Most of the northern embankment has been developed, as seen here, but there are small pockets of land where clumps of Blackthorn (Prunus spinosa) and Hawthorn (Crategus monogyna) have established. The ground cover in these gaps consists of a mix of plants and grasses including Nettles, Cow Parsley and Goosegrass (Galium aparine). The southern, shore side embankment is grassy with clumps of wind-stunted shrubs such as Elm and Hawthorn. Teasel, Coltsfoot, Burdock, Smooth Hawk's Beard, Prickly Oxtongue, Sea Mayweed, Pineapple Mayweed, Common Fleabane are among the many herbaceous plants growing in the well-drained, exposed conditions. 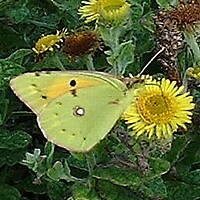 In August 2000 a large influx of Clouded Yellow butterflies (Colias croceus) appeared in Shoreham and Lancing. 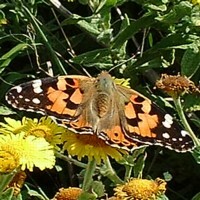 Many of them were sighted on the vegetated area of the Laggon. Similar sightings were reported over much of southern England.